Success Story of Sminu Jindal, MD, Jindal Saw Ltd.
You might be excused if you gape at Sminu Jindal. She is quite used to it. Busy shuffling around in her wheelchair as she goes about her office work, it takes a while to realise that she is paralyzed waist downwards. She makes multitasking on a wheelchair look so simple. As the managing director of Jindal Saw, one of the flagship companies of USD 12 million of OP Jindal Group, Sminu has been instrumental in the diversification for pipe manufacturer to one with interest in infrastructure, transportation, logistics and fabrication.. .Sminu Jindal is the first lady entrant in the country to do her gender proud by breaking the glass ceiling in the steel, oil and gas sector in India. She is a woman of steely resolve. 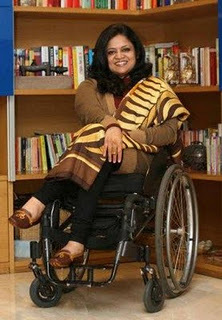 Sminu Jindal broke the stereotypical Marwari family mould and stormed the corporate boardroom that too in a wheelchair. In spite of being confined to the wheelchair due to an accident at the age of 11, she has not allowed her spirit to be chained. On the contrary, it has added wheels to her determination to take life head on. After completing her elementary schooling in Delhi, Sminu had joined the boarding at the prestigious Maharani Gayatri Devi School in Jaipur with a view to acquire holistic quality education. It was on one of those drives back home from Jaipur to Delhi that she met with a near fatal accident. It was while she was returning to Delhi from her school, Maharani Gayatri Devi Girls’ School in Jaipur, that her car met with a terrible accident in which she lost movement of her lower body. “It took me a long time to realise what had happened to me, but my parents stood rock solid in helping me cope with the repercussions of the accident. She was fortunate to survive but sustained a severe spinal cord injury and brain hemorrhage. The spinal injury left the lower half of her body paralysed. The next few years were very difficult and traumatic for her. She was just a young child of eleven in class six. As she woke up to the reality facing her, she shuddered at the thought that it would no longer remain the playful carefree life she had known. What hurt her most was the realization that she would no longer be able to dance. She was a talented Kathak dancer and a distinction holder at Bhartiya Kala Kendra at the age of nine. Sminu does not flinch a bit while talking to me about this agonizing phase of her life and recalls with serene equanimity that it was indeed a period of complete personal mess. It was her family that became a deep source of emotional and psychological support for her in those moments. Her parents, especially her mother Arti, instilled the confidence in her that she would be able to go to a normal school and continue the day-to-day activities. They would encourage her to do the small routine things on her own without seeking anyone’s sympathy or support. She would carry her bag to school, go for tuitions outside home like her sisters did and later joined a regular co-ed college after studying in a convent. Thus she ‘was cared for but was not pampered’. This significant training at home toughened her mind and made her self-reliant so that she could face the life ahead with courage. View her inspiring video by clicking this link. They never treated me differently from my sisters. My two younger sisters were also very sweet. When we would fight, I would call out to them to come and get thrashed by me and they would come! So it was a very normal upbringing for me where I was never given any special consideration, be it organizing my cupboard or getting stuff from the kitchen. What is great is that once my parents accepted my condition, they educated themselves about it and found out the best possible treatments that would help me grow up the normal way. And all this does not come out of quivering lips. Sminu is jovial and jests all along. She talks about her condition in the most matter-of-fact way. There is no hesitation or reluctance. She has no problem in accepting her condition, and neither has her husband, Indresh Batra, found it an issue. They met at a friend’s party where the two got along over “nonsensical banter”. After which one thing led to another and they got married. They have two sons aged six and three. Incidentally, Sminu had a natural conception, after which she went to the US where experts tracked her pregnancy. Her message is simple: “What makes a person special is her work, her compassion and not her condition.”. It is easy to get impressed by her, since Sminu Jindal is an exceptional and exemplary woman of substance who does not shy away from challenges in all walks of life. Her organisation ‘Svayam’ (an initiative of S J Charitable Trust) has been working closely with NDMC, ASI, DTC and the Education Ministry of Delhi to make public conveniences units, historical monuments like the Qutub Minar and Jalianwala Bagh, bus queue shelters and government schools accessible to all those with reduced mobility. Next on her agenda is to sensitize tourism in India – to help people with reduced mobility enjoy the splendour of our country. This entry was posted in Uncategorized and tagged Jindal Saw Ltd, MD, S J Charitable Trust, Sminu Jindal, Svayam. Bookmark the permalink.